The Ultimate Windows Web Server Security Solution - Server 2016/IIS 10 Support! Don't sweat unaddressed vulnerabilities, insider misuse, or new types of attacks. 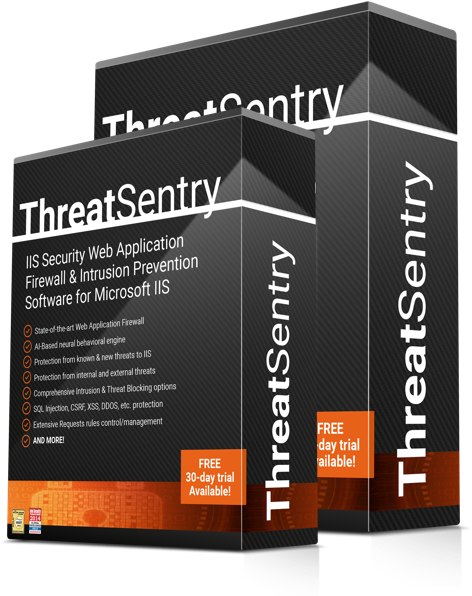 ThreatSentry combines a state-of-the-art Web Application Firewall and port-level firewall with advanced behavioral filtering to block unwanted IIS traffic and web application threats. ThreatSentry delivers enterprise-grade, multi-layered protection and compliance (i.e. PCI DSS) for Microsoft IIS (5/6/7/8/10) at a small-business price! Implemented as a native module in IIS7 through 10 (or ISAPI extension or filter in IIS 6 and IIS 5 respectively), and Snap-in to the Microsoft Management Console (MMC), ThreatSentry is exceptionally easy to use and designed to protect network weak points created by lapses in patch management, configuration errors, and the use of new and progressive attack techniques. Take advantage of a free ThreatSentry evaluation session today! We'll guide you one-on-one through installation and configuration. Click here to schedule. ▪ IIS 5, 6, 7, 8 and 10! ThreatSentry provides protection from an array of documented exploitive techniques, including SQL Injection, Denial of Service, Cross Site-Scripting (XSS) and Cross-Site Request Forgery (CSRF). ThreatSentry web application defense capabilities are designed to address the most critical web server and application security flaws as detailed in the OWASP Top Ten Project and reduce the risk of data theft, site defacement/disruption and non-compliance. ThreatSentry delivers proactive defense for IIS and prevents attacks from exploiting web application vulnerabilities through a complementary set of integrated components. - State-of-the-art Web Application Firewall: Provides configurable rules-based control over HTTP/HTTPS request methods (OPTIONS, GET, POST, HEAD), URL Paths, URL Query String length, and HTTP Request Headers, rule-specific URL/s exclusion capabilities, URI Encoding support, Regular Expression support for parameter rules/filtering, etc. - Fully integrated Firewall: Proprietary NDIS driver delivers flexible network IP blocking (featuring white list, black list and duration control) at TCP/IP and UDP layers for all ports. - Behavior-based Intrusion Prevention: Adaptive, behavior-based engine (with sensitivity control) analyzes Web traffic patterns to detect new threats and behavioral anomalies and deviations. - Anti-DoS/DDoS: Configurable request frequency monitor blocks successive requests to individual or all site pages to reduce the risk of DoS and DDoS attacks. The ThreatSentry management console reduces cost and overhead by providing administrators ultra-granular control over configuration settings, trusted and untrusted event management, rule and signature definition, blocked IPs, alert notification and the sensitivity level of behavioral engine for single or multiple server environments. . Implemented as a native module in IIS 10, IIS 8/8.5 and IIS 7 (or ISAPI extension or filter in IIS 6 and IIS 5 respectively), and Snap-in to the Microsoft Management Console (MMC), ThreatSentry is exceptionally easy to use and affordably priced for enterprises of any size. "We have never observed a more effective, elegant, or easier-to-use complement to software or device-based firewalls..."
The application seems easy to configure and has blocked many scans from hackers attempting to see if the server has any vulnerabilities. I have been happy with the results,.."
"ThreatSentry is still doing a great job........ I am amazed and appalled at the number of hack attempts."